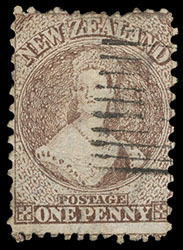 New Zealand, 1871, Queen Victoria "Chalon Head", 1d deep brown, perf 12½x10, Large Star watermark, bright color, rectangular bar cancel of Wellington province, thin spot; with clear 2009 Odenweller certificate. Scott No. 42 var. Campbell Paterson No. A1o. SG No. 127 £4,750 ($6,240). AN EXCEPTIONALLY RARE STAMP WITH ONLY FIVE RECORDED EXAMPLES. The five recorded examples of the 1d deep brown perf 12½x10 comprise 3 singles and a pair on cover. As an indication of rarity, an example of this stamp was not present in the Hackmey. 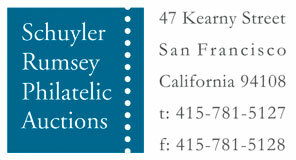 This example has a Wellington province rectangular cancel that accords with the known usage. The pair on cover is cancelled with a Palmerston North cds and adjacent Foxton (11.27.71) datestamp. References: Illustrated in Odenweller as part of fig. 10.12, p. 162. 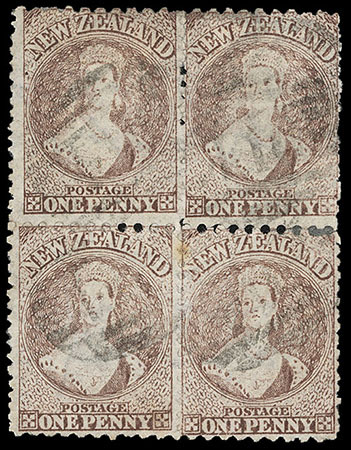 New Zealand, 1871, Queen Victoria "Chalon Head", 1d reddish brown, perf 10 x 12½, Large Star watermark, block of four (R. 16-17/1-2), Pos. 17/1 showing plate scratch, lightly cancelled by barred ovals; small tone spot and some reinforced perf separations at right, Fine and rare used block showing plate scratch, Yeroc, J.M.A. Gregson, January 2000, lot 668. Scott No. 42 var. Campbell Paterson No. A1p (1). SG No. 128 var. Estimate $300 - 400. DuBois (Hiroaki Inoue), Matthew Bennett, May 2007, lot 2375; with clear 2006 Odenweller certificate. Scott No. 42. Campbell Paterson No. A1p (2). SG No. 128 Estimate $750 - 1,000. THE LARGE RECORDED USED MULTIPLE OF THE 1871 1D BROWN PERF 10 X 12½ ISSUE. 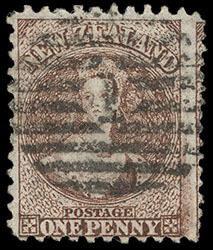 New Zealand, 1871, Queen Victoria "Chalon Head", 1d red brown, perf 12½ comp 10 (1 side), Large Star watermark, exceedingly well centered within large margins, bright color and paper, cancelled by bold numeral "5" barred circle, fresh and Extremely Fine. Scott No. 42 var. Campbell Paterson No. A1p (Z). SG No. 128a £200 ($260). 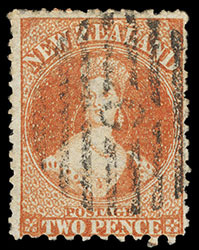 New Zealand, 1871, Queen Victoria "Chalon Head", 2d orange-vermilion, perf 10 x 12½, Large Star watermark, o.g., hinge remnant, bright vibrant color, fresh and Very Fine. Scott No. 43 var. Campbell Paterson No. A2r. SG No. 130 £325 ($430). 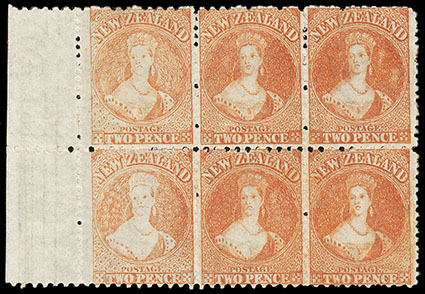 New Zealand, 1871, Queen Victoria "Chalon Head", 2d orange-vermilion, perf 10 x 12½, Large Star watermark, left margin block of six (R. 16-17/1-3), Pos. 16/1 & 17/1 retouched, o.g., couple small hinge remnants, well centered, beautiful bright color and paper, fresh and Very Fine, Antipodes, Corinphila, September 1988, lot 3663; with 1988 Holcombe certificate. Scott No. 43 var. Campbell Paterson No. A2r (Y). SG No. 130, 130a Estimate $1,000 - 1,500. 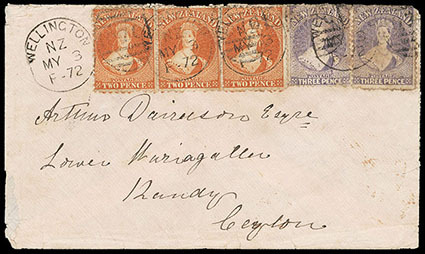 A MAGNIFICENT MINT MARGINAL MULTIPLE OF THE 1871 2D ORANGE VERMILION PERF 10 X 12½. 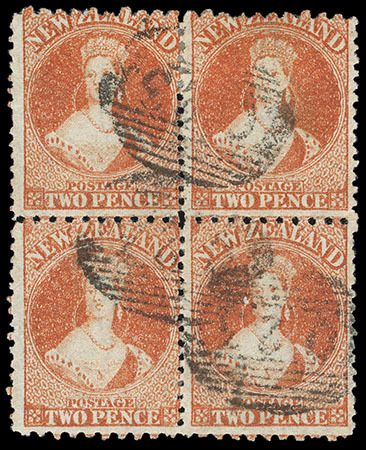 New Zealand, 1871, Queen Victoria "Chalon Head", 2d deep orange vermilion, perf 10 x 12½, Large Star watermark, block of four, strong rich color, cancelled by "O23" barred ovals of Clyde, bottom right stamp tiny abrasion speck, otherwise fresh and F.-V.F., DuBois (Hiroaki Inoue), Matthew Bennett, May 2007, lot 2379. Scott No. 43 var. Campbell Paterson No. A2r. SG No. 130 Estimate $200 - 300. 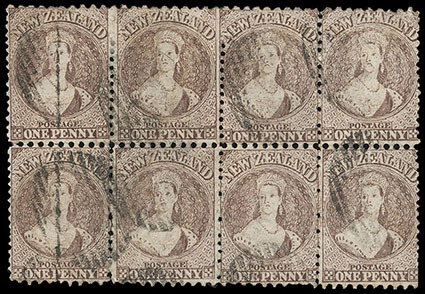 New Zealand, 1871, Queen Victoria "Chalon Head", 2d vermilion, perf 10 x 12½, Large Star watermark, pair and single, rich color, used with two 3d lilac (117) singles, all cancelled with "070" duplex with "Wellington NZ, MY 3, F -72" on light pink buff cover to Kandy, Ceylon, reverse with Nelson (5.13), Galle (6.12) transit cds and Kandy (6.13) arrival cds; the envelope with some slight peripheral faults, 3d stained and stamps lifted, creases ironed and reaffixed, a Very Fine appearing use to a rare destination, Joseph Hackmey, Spink Shreves, February 2009, lot 1453; with 2002 R.P.S.L. certificate. Scott No. 43 var. Campbell Paterson No. A2r. SG No. 130 Estimate $1,000 - 1,500. This cover was apparently sent in error to Nelson and therefore reached Sydney too late for the "Nubia" that departed Sydney June 16th 1872, and was held for the "Bangalore" that departed Sydney July 14th and arrived at Galle Aug. 9th. Cover was prepaid for the 1s per ½ oz. rate to Ceylon. 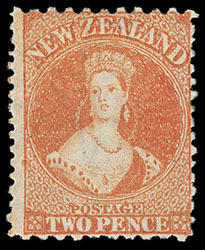 New Zealand, 1871, Queen Victoria "Chalon Head", 2d vermilion, perf 12½ comp 10 (1 side), Large Star watermark, well centered, strong vibrant color on bright paper, cancelled by barred "O", fresh and Extremely Fine, Yeroc, J.M.A. Gregson, January 2000, lot 688. Scott No. 43 var. Campbell Paterson No. A2r (X). SG No. 130b £475 ($620). 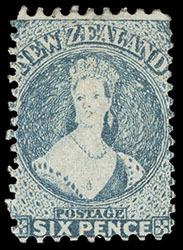 New Zealand, 1871, Queen Victoria "Chalon Head", 6d blue, perf 10 x 12½, Large Star watermark, unused without gum, well centered with full intact perfs all around, Very Fine. Scott No. 44. Campbell Paterson No. A5j (3). SG No. 131a £2,000 ($2,630).